Returning RSVPS, shopping on registries, attending showers, and bachelorette parties fills your weekends in the coming months for many of us. Wedding season is upon us and if not finding the best couple engraved silver, finding the right dress for each wedding on your daily planner is a job in itself. 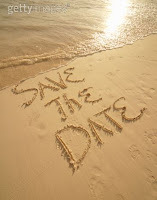 I have found some of the best picks for any type of wedding you have to attend whether it be beach front or black tie. There are of course some rules in considering a dress for your best friend's wedding. They say to not wear white, I disagree.Don't wear a white ball gown, or a white dress with bling, taffeta or bridal looking. A white summer dress is appropriate considering the venue and the theme. It is easy to wear a dress you already have, but it needs to fall to an appropriate length and also not show too much on top. Most weddings are more formal then not, and keep in mind your fun newlyweds will be inviting their grandmas, leave the cleavage dress for Saturday night out. This dress by Vivienne Westword is a great choice found on www.zappos.com for $784. Don't let a beach wedding let you make an excuse for flip flops. Flip flops are never OK at a wedding even for bridesmaids at the reception which has suddenly become OK to some and shame on the bride for providing. I love this blue dress by Cynthia Vincent on http://www.piperlime.com/ for $299. Attend a wedding in style for a budget. Look at these great finds! I love this outside wedding guest dress. This one is from Anthroplogie for under $150!! 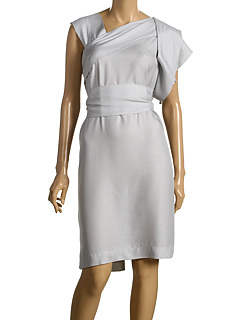 Another great option for a summer casual wedding is this dress from Akira Chicago. This dress is under $120! Love the color and fit! Click HERE.